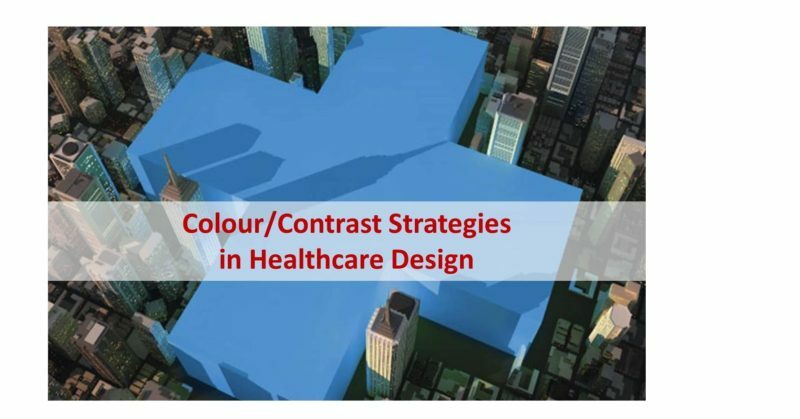 I had the opportunity to meet with members of the New Zealand Health Design Council and deliver a seminar on effective colour contrast strategies in healthcare design aimed at improving environmental visual literacy. The NZHDC is a network of professionals that meets monthly and is dedicated to advancing quality of design, planning and management of New Zealand’s health facility infrastructure. Members are drawn from architecture firms that specialise in healthcare and aged care as well as design and construction firms. In my seminar to the NZ Health Design Council, I discussed specific colour contrast strategies that can improve and enhance engagement, support orientation and wayfinding strategies, and contribute to the safe performance of daily activites. In addition, due to the mechanics of human visual perception, colour contrast strategies also have the capacity to improve environmental visual literacy for older people and people with declining visual and cognitive capacity. NZHDC audience members included Euan Mac Kellar (Principal) and Adele King (Jasmax Architects); Miller Guiguis (Peddle Thorp); Jeremy Liu and Melanie Smith (Beca Constructions); Rachael Rush (MD of Klein), Sam Williams, Nicholas Wedde (Klein Architects); Daryl Carey (Director), Anner Chong, Noora Hashini, Bridget Trevena, Edith Chan (Chow Hill Architects); Patrick Long (Counties Manukau District Health Board); Graeme Fletcher (Jacobs Construction Services); Matt Brown (WAM). Image sourced from NZHDC. For more information about NZHDC, go to their website.